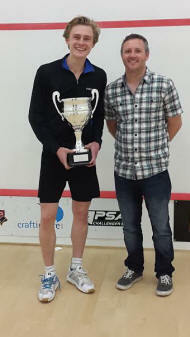 No.2 seed Tom Ford claimed his first PSA World Tour title for six months when he won a thrilling final of the Select Gaming Kent Open against Welsh outsider Joel Makin. Ford, a tall left-hander from Cheltenham, took 83 minutes to wear down an opponent playing his eighth match in 12 days. Makin, who was runner-up in the Stortford Classic a week earlier, was on his knees in the closing stages but kept battling through his obvious exhaustion to lead 9-8 in the fifth game. 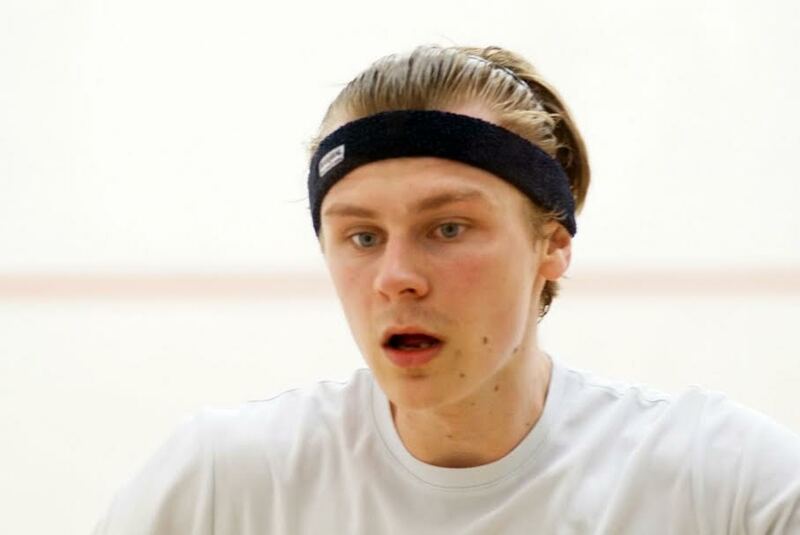 But Ford, who has developed into a stylish, attacking player, finished strongly to win the final three points with shots of stunning accuracy before a packed gallery at The Mote Squash Club in Maidstone, Kent. The contrast in styles created a fascinating encounter with Ford angling his soft volley drops into both front corners with Makin’s powerful, physical approach producing some unbelievable retrieving and plenty of winners of his own. Both players had battled through punishing, five-game semi-finals, with Ford beating Peter Creed in 87 minutes and Makin outlasting top seed Charles Sharpes after 104 minutes of mayhem. However, they both looked fresh at the start with rallies of 50-plus shots. Ford led 8-5 in the opening game before No.8 seed Makin stormed through to win it 11-8. The second and third games were both settled on tiebreaks and, after almost an hour’s play, Makin led two games to one. Ford sensed his opponent was tiring and raced through the fourth game in six minutes. He was in front all the way through the fifth game until he reached 8-6, when he lost three points in a row as Makin made one final, dramatic push, despite finishing many rallies bent double with fatigue. Ford’s cool temperament saw him control the final, punishing exchanges with some precision rallying. He worked his opponent into every corner of the court to reel in one of the biggest prizes of his career and his first tournament win since two titles in Canada in November. A delighted Ford said: “I want to thank a lot of people for running this superb tournament but the man I need to thank the most is the resident osteopath, Nick Griffith, who has treated me every day for an injury to my ribs and helped me to compete. “Having extras like that available to us means a lot to the players and we appreciate it very much. It is a tough life on the tour and sometimes it can be a lonely existence but I have really enjoyed all the interaction with the Mote members during the tournament. “It is lovely to play in a proper squash club in front of knowledgeable and appreciative audiences. Makin, when asked how he felt during the fifth game, replied: “I was pretty tired in the first game, let alone the fifth. 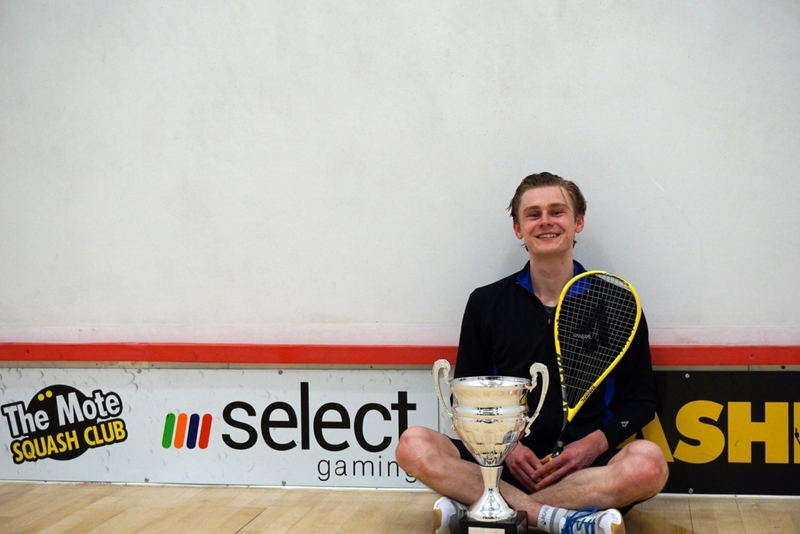 It was the youngest final in the eighth edition of the Kent Open, with Ford at 22 years of age and his opponent one year younger. As Ford raised aloft his trophy after receiving it from title sponsor Jonny Powell, of Maidstone-based Select Gaming, spectators agreed that it was the best final in the tournament’s history. 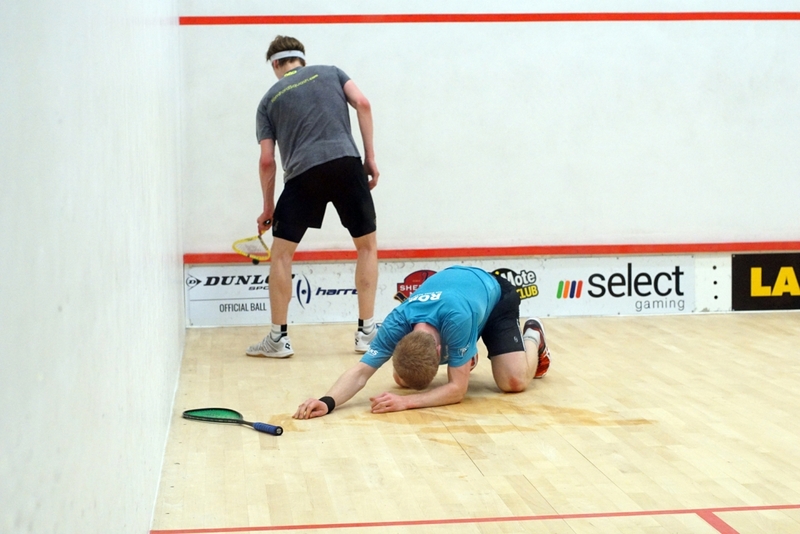 Top seed and reigning champion Charles Sharpes crashed out of the Select Gaming PSA M10 Kent Open after a dramatic and often physical contest with Welsh No.2 Joel Makin (right). Their semi-final battle lasted 104 minutes, seven minutes less than an equally unpleasant final of the Stortford Classic last week contested by the same two players and won by Sharpes. In contrast, No.2 seed Tom Ford overcame Welsh No.1 Peter Creed in the opening semi-final in an absorbing match that ebbed and flowed with brilliant, attacking squash, coupled with astonishing retrieving in a match that was a credit to the professional game, with honesty, commitment and sportsmanship in equal measure. Both matches went to five. Ford protected a 10-6 lead and closed out the match 11-9 after a late wobble. Makin won 16-14 after Sharpes wasted a 10-7 lead. Ford has developed into a flamboyant, attacking player with an impressive range of attacking shots. Much of his match with Creed took place in the front half of the court with both players attempting spectacular winners, which in turn produced equally impressive retrieving. Ford (left) won the opening game the hard way. He powered ahead to lead 10-6 but Creed won five points in a row before Ford nailed it 13-11. He dominated the second, winning 11-6, and the 22-year-old looked to be heading for a place in the final as he led 7-4 in the third. However, Creed showed why he is rated one of the best athletes in the game as he hurled himself around the court, combining some gut-wrenching retrievals with superb winners. He won the third 11-8 and took the fourth 13-11 after some fast and furious rallies. Creed led 5-3 in the fifth before Ford put together a phenomenal spell of controlled aggression to win six points in a row. 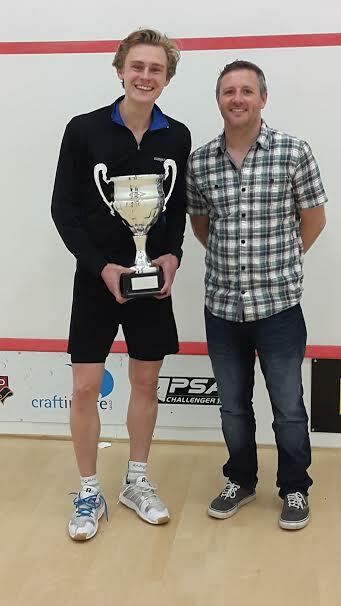 After a couple of tins he closed out the match and booked his first appearance in a PSA final since November. He said: “Peter is such a great competitor that I always knew that a big fight back would emerge at some stage. “It was a really enjoyable match to play and I love the whole atmosphere here at the club. It’s great to see the club packed out every day and the players really enjoy coming here. In a bizarre twist, the second semi-final finished on a conduct stroke for racket throwing for the second night in a row. Last night Jaymie Haycocks was punished for his indiscretion after Sharpes had been awarded a conduct stroke. This time it was Sharpes who conceded the stroke and launched his racket towards the front wall after a momentous battle in the fifth game. Makin gleefully celebrated the decision. It was an unfortunate end to a brutal contest. It wasn’t pretty. But it was raw, high-octane sporting endeavour, compelling drama to the end. 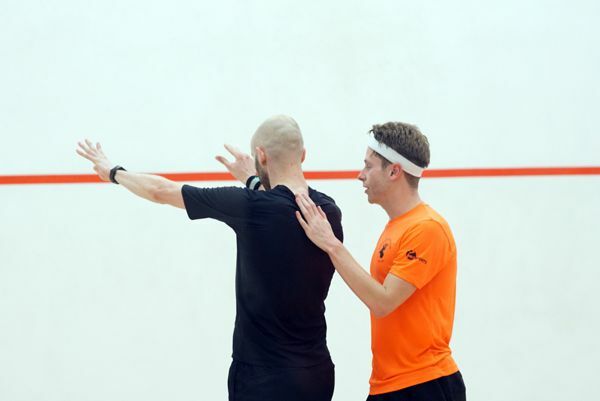 Peter Creed and Joel Makin celebrated a Welsh double as they progressed to the semi-finals at the PSA M10 Select Gaming Kent Open. Makin took out No.3 seed Richie Fallows and Creed played superbly to beat talented Australian Matthew Hopkin. Makin faces top seed Charles Sharpes in a repeat of last week’s Stortford Classic final which Sharpes won in five games over 111 minutes. Creed tackles No.2 seed Tom Ford. Both Creed and Makin enjoyed straight-games victories in front of a packed gallery at The Mote Squash Club in Maidstone, Kent. But there was a huge contrast in the style and atmosphere of each contest. Creed’s match was full of entertaining exchanges at the front of the court and some blindingly brilliant retrieving from both players. Hopkin led in all three games but Creed finished strongly in each one. The following match, however, was full of unpleasant verbal exchanges as Fallows hit the self-destruct button. His touch play has improved significantly but his temperament is clearly still a work in progress. After the match he admitted he was considering his future in the game and said: “Referees are making it really difficult for me to play the game. I feel that they are picking on me all the time and every time I play a backhand drop shot it seems to be a stroke against me. His opponent, Welsh No.2 Makin, was delighted to win through and said: “It certainly felt like Richie talked himself into a lot of trouble. It was a hard, tough first game but he lost his way in the second when he started getting involved with the referees. On a busy night for the referees, Charles Sharpes won through to the last four when Jaymie Haycocks was conduct stroked on match ball after throwing his racket at the front wall. In contrast, Tom Ford and Patrick Rooney played superb squash with hardly a let. All three games were tight as the 18-year-old Rooney showed how much he is improving as a player. Ford won 11-9, 11-8, 12-10 and said: “I have seen Patrick on court at national squads and I am very impressed with the intelligent and mature way he has developed. He has a good hold and moves the ball around well. 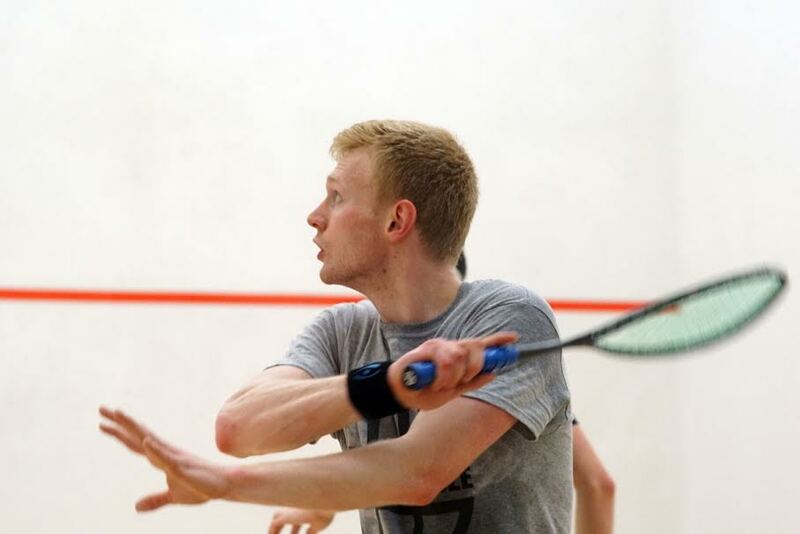 Joel Makin of Wales continued his excellent run of form by beating rising Egyptian star Youssef Soliman in the first round of the Select Gaming Kent Open at The Mote Squash Club in Maidstone. Makin, who beat the higher-ranked Ben Coleman and Welsh number one Peter Creed on the way to last week’s final of the Bishop’s Stortford Classic, ended Soliman’s unbeaten run in UK tournaments this year. Soliman had followed up his triumph in the British Junior Open Under-19 competition by winning PSA titles in Aberdeen, Jersey and Ipswich. After a successful run through qualifying he came up against a determined opponent who matched his pace and won the contest with a more disciplined, controlled approach. While Soliman self-combusted in the fifth, hitting tins, conceding strokes and arguing with the referee, Makin remained calm to clinch victory 8-11, 12-10, 11-8, 6-11, 11-3 in 82 minutes, the longest match of the night. He said: “I was very pleased with the way I played last week and kept that form going tonight. I knew his reputation for playing at a high pace and he has obviously had a good run in recent tournaments. I felt I contained him well and was happy to play my own game. At times the match grew a little scrappy, with referee Wendy Danzey forced into making 37 decisions. Makin will be hunting another major scalp when he meets No.3 seed Richie Fallows in the quarter-finals. Fallows had a battle on his hands before he overcame Lyell Fuller 16-14 in the fourth game. Top seed and reigning champion Charles Sharpes beat Pakistani qualifier Asim Khan in straight games, although there were several highly competitive passages of play before Sharpes closed out the match. In the quarter-finals he faces Jaymie Haycocks, who removed Ireland’s lucky loser Brian Byrne in four entertaining games. 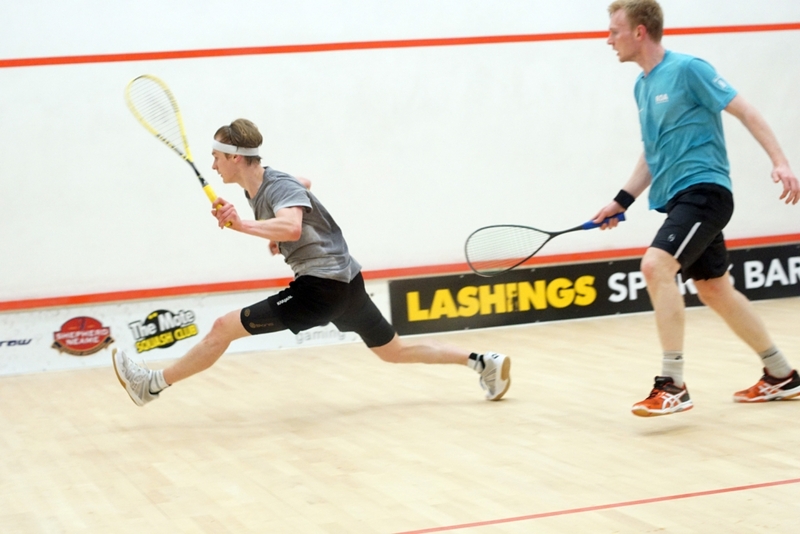 No.2 seed Tom Ford won a hard-hitting all-English battle with Ashley Davies in four games, although the match threw up a bizarre scoreline of 12-10, 11-9, 3-11, 11-2. Davies squandered a game ball in the first and the second was also a close-run affair. However, Davies powered through the third and was 8-0 up before Ford registered point. The fourth was similar, although this time Ford reached 10-0 and match ball before Davies managed to avoid the bagel with two late points. Ford now meets 18-year-old Merseysider Patrick Rooney, who squeezed home 3-2 against Ireland’s Arthur Gaskin, who was suffering from cramp as the match wore on. Australian Matt Hopkin won his opening match against Chris Fuller 11-9, 11-6, 11-1 in 38 minutes – and that included a 10-minute stoppage to have a blood injury treated. He said: “I twisted my ankle at 1-1 in the first game and then grazed my knee as I hit the floor so had to go off to stop the blood flowing. Fuller, renowned for some marathon matches in previous years at The Mote, was at a loss to describe his rapid exit. It’s not often that four matches produce five winners but that was the case with tonight’s qualifying finals of the Select Gaming Kent Open. If that sounds a bit Irish, blame Kilkenny’s finest squash player, Brian Byrne, who lost a spectacular match against Egyptian firecracker Youssef Soliman but was then rewarded with a Lucky Loser slot in the main draw after the withdrawal of the injured Joel Hinds. A hip injury forced Hinds to quit, but it turned into good fortune for Byrne, who battled toe-to-toe with Soliman for 47 minutes before the Egyptian powered through to a first round tie against the in-form Joel Makin. It should be quite a match. 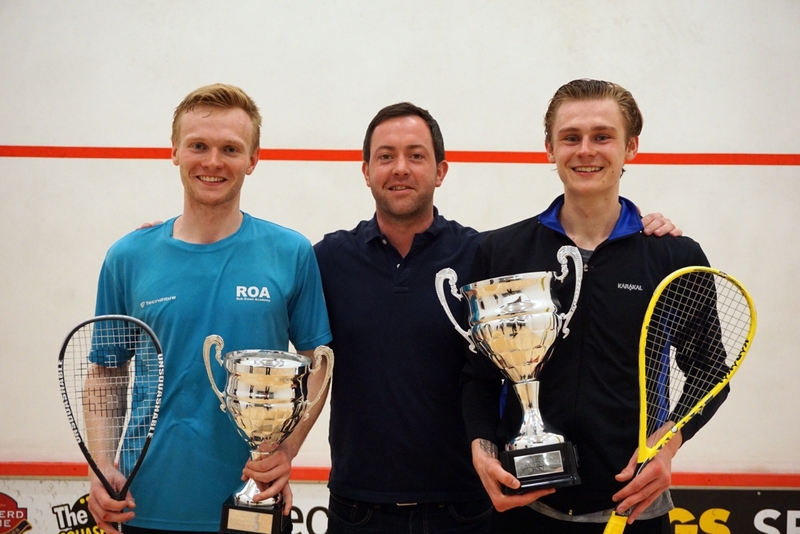 Makin beat Welsh number one Peter Creed and top seed Ben Coleman in last week’s Bishop’s Stortford Classic before losing a five-game final to the Kent Open’s top seed and reigning champion, Charles Sharpes, in a battle lasting 111 minutes. Soliman makes his first appearance at The Mote after a fantastic first half of 2016. 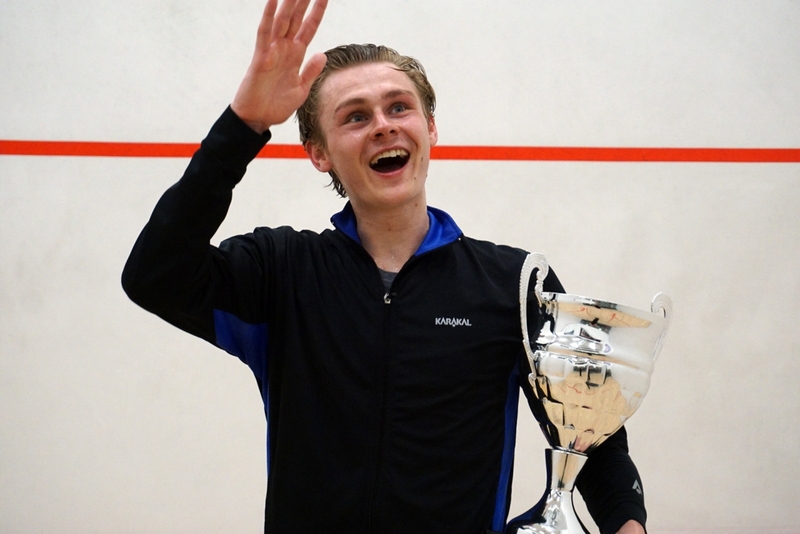 After winning the British Open Under-19 title at Abbeydale, he won the $10k North of Scotland Open in Aberdeen before winning two $5k tournaments in Ipswich and Jersey. In all of them he had to work his way through to the final from qualifying. The quality of his match against Byrne was worthy of a far higher status. With shot-making and retrieving of an astonishing quality, it was hard to comprehend that we were witnessing a qualifying tussle. Soliman won 11-4, 11-9, 11-7 but Byrne earned the title of Mick Rodriguez for some amazing shots through his legs and behind his back. His real name then came first out of the pint glass for the lucky loser draw for a first round tie against number five seed Jaymie Haycocks. Soliman and Byrne were first up in the qualifying finals and the intensity they produced was matched in all three of the matches that followed. Patrick Rooney is looking in superb form. After starting the tournament with a bagel (11-0) first game win against Sean Conroy of Ireland, he followed up with a powerful performance to beat Ondrej Uherka of Czech Republic. Rooney pulled away from 6-4 to win the opening game, but let slip an 8-7 lead in the second as Uherka finished strongly. Rooney then tightened up all aspects of his game to win the third 11-3 and the fourth 11-5. Rooney’s reward for his 38-minute victory was a first round clash with number six seed Arthur Gaskin from Ireland. Bermudan Micah Franklin and Pakistan's No.2 seed Asim Khan left everything on court after a 72-minute marathon which could have gone either way. Khan looked edgy and nervous as he struggled past 39-year-old Mote Head Coach Chris Tomlinson in the first qualifying round, but here he demonstrated enormous physical resources to withstand a determined attack from Franklin. Khan edged the first game 14-12 and fought back from 7-3 down in the second to lead 9-8, but Franklin closed out the game 11-9. Khan was in control throughout the third as Franklin's accuracy deserted him, and the fourth was almost a carbon-copy of the second as Franklin played aggressively to lead 8-2 only for Khan to draw level with a run of six points. Again Franklin squeezed home to take it to five. From 0-3 down he won four points in a row, but then Khan did the same. Back came Franklin and at 7-7 it was anybody’s match to win or lose. Khan’s tight drops were the decisive factor as he won the final four points to gain a place in the main draw against top seed Charles Sharpes. Nick Mulvey fought back from two games down to beat top qualifying seed Joe Green on Tuesday, and almost suffered the same reversal of fortunes himself as Kent’s Ben Ford recovered from two games down to take the match to five. But in another match of high intensity and superb squash, Mulvey held it together to win 11-8 in the decider after 68 minutes of pure drama. The 40-year-old Ford recovered from two games down in impressive fashion to take the match to his opponent with some inventive shot-making. Mulvey now meets Welsh number one Peter Creed, the fourth seed, in the bottom half of the draw. The Mote’s Head Coach Chris Tomlinson came desperately close to a stunning victory in the Kent Open Squash Championship. In front of a packed gallery at The Mote, the 39-year-old Tomlinson led by two games to love against the number two qualifying seed, Asim Khan from Pakistan. The 19-year-old from Lahore was constantly wrong-footed as Tomlinson stepped up the court and fired in a succession of dazzling winners. Tomlinson led 7-4 in the third game and was just a handful of points away from victory. But the enormous effort took its toll and Khan forced his way back to hold game ball at 10-9. Tomlinson twice drew level but Khan held his nerve to win the game 14-12. It was a massive turning point. The scores were level at the mid-point of the fourth and fifth games but each time Khan pulled away to clinch victory, with a scoreline of 8-11, 9-11, 14-12, 11-6, 11-7 after 63 minutes of thrilling squash. Another Kent legend, Bexley’s Ben Ford, earned a place in the qualifying finals when he beat The Mote’s Bradley Masters. Ford, the British over-35 champion, is now one of the country’s leading coaches and has been working with Masters and his brother, world No.81 Josh, for several years. The 19-year-old Bradley won the opening game but the 40-year-old Ford’s experience and silky racket skills saw him through to face Nick Mulvey from Hertfordshire. 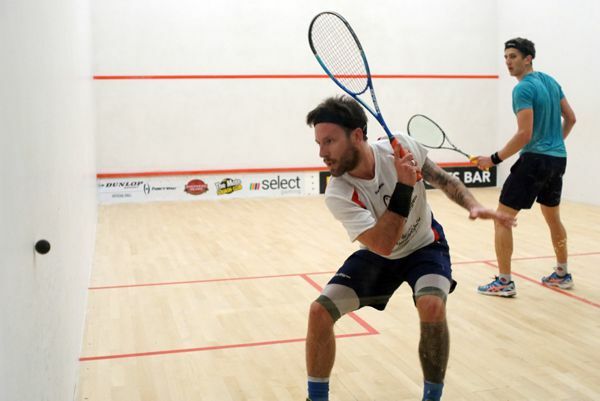 Mulvey fought back from two games down to beat top qualifying seed Joe Green. Bexley’s Gary Nisbet, winner of the pre-qualifying competition for local players, went down to Micah Franklin of Bermuda. 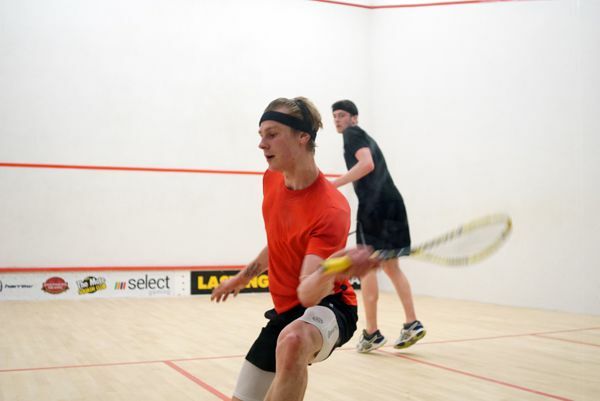 Joe Green, top qualifying seed in the Select Gaming Kent Open, squandered a two-game lead and match-point in the fourth as he lost to Nick Mulvey at The Mote Squash Club in Maidstone, Kent. Green, the 21-year-old world No.140 from Watford, looked comfortable as he took the first two games but failed to finish the task off as Mullet battled his way back into the game. Mulvey, the 23-year-old from Bishop’s Stortford, took the third game and led 7-2 in the fourth before Green strung together a run of points to reach match ball at 10-9. However, Mulvey finished the game strongly to win it 12-10 and take the match to a fifth. This time Mulvey raced into a 7-3 lead and held his nerve to complete victory in 70 minutes. The number two seed, Asim Khan from Pakistan, also came close to a shock defeat as 39-year-old Chris Tomlinson, the Head Coach at The Mote, played some dazzling attacking squash to build a two-game advantage. Khan staged a phenomenal recovery to win the third game 14-12 and just edged the final two win 11-7 in the fifth game after 63 minutes. Ben Ford, the English national over-35 champion and one of the country's most outstanding coaches, had to overcome one of his pupils to enter the qualifying finals. Bradley Masters, younger brother of world No.81 Josh, took the first game but Ford’s massive experience and sublime racket skills earned him a comfortable victory. Patrick Rooney made it a trio of English winners by beating Ireland's No.5 seed Sean Conroy, while Conroy's Dublin colleague Brian Byrne ended the hopes of The Mote's James Evans in straight games. No.3 seed Rui Soares of Portugal fell to Andrej Uherka of Czech Republic after the winner needed a time-out for a bleeding knee. 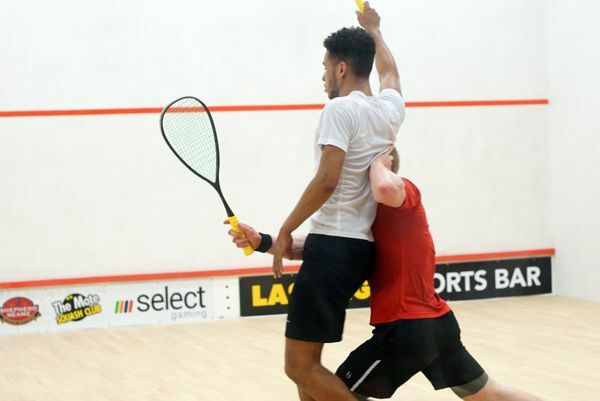 Egypt's Youssef Soliman sent out a warning to the rest of the draw with a straight-games win over Emyr Evans, but the young Welshman played some excellent squash and was far from outclassed. Micah Franklin of Bermuda ended the hopes of the pre-qualifying winner, Gary Nisbet, and now meets Khan.